Farmgirl Fare: Sunday Farm Photo: Once the Treat Trough is Empty. . .
Sunday Farm Photo: Once the Treat Trough is Empty. . . It's time to head back out in the field. © FarmgirlFare.com, where green comes in about 459 different shades this time of year. 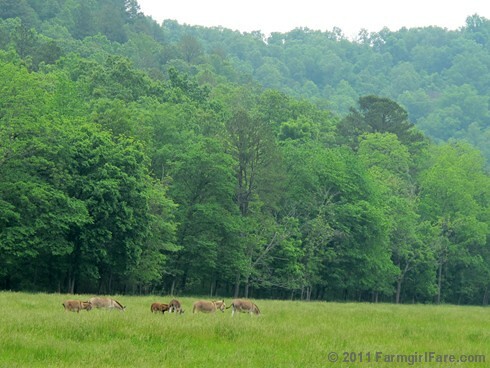 Donkeys grazing in a field of green... ahh! It really looks beautiful and lush - gorgeous!! I love your blog. I feel like I'm there with you with all the great photos and descriptive posts. I cry over Cary all the time, such a good sheep. Within the link, there's a 7 minute audio interview (with donkeys in the background!) I hope you're able to listen to it.